Riobet: A Great Sportsbook for Pre-Match and Live Bets? Riobet Casino, operated by Karoliana LP, has been the home of large casino game libraries and sports betting market since 2015. 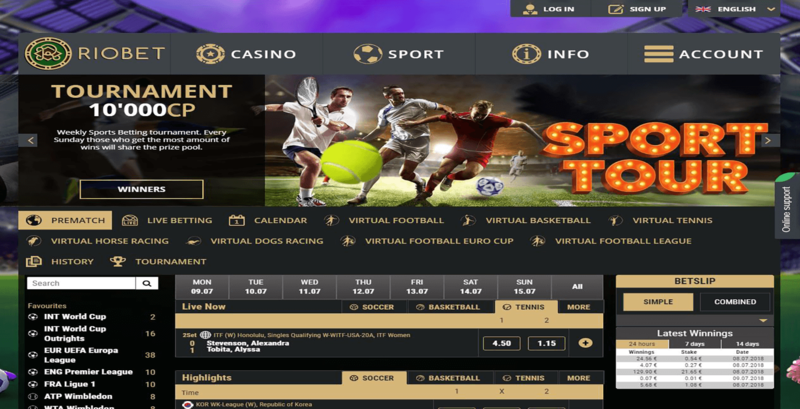 The gaming site caters to punters in most EU countries. Unfortunately, the sportsbook does not allow punters from several countries like the UK and US to sign up. You can read the terms and conditions to see if you are not in one of the restricted countries. The gaming site owns a Curacao license which may not help you when you run into some problems with the website. But the sportsbook provides several features to help you protect your account and money. These features include a security pin and codes that you need to enter when you cash out your money. With an extensive listing of betting markets available and security measures for your account, can Riobet win you over with its services? Read on to find out. 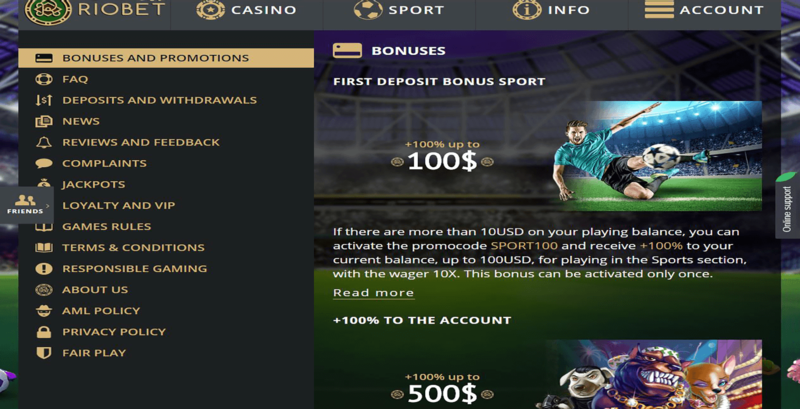 In terms of Bitcoin sportsbook bonuses, Riobet may disappoint you as these offerings are not available to punters living in Poland, US, Turkey, and the Netherlands. Also, the limited bonuses on Riobet may further put off many punters since there are a limited number of promotions under the site’s sportsbook section. The promo you get from this sportsbook is the First Deposit Bonus Sport promo that provides 100% match bonus up to 10 mBTC. You need to deposit at least 1 mBTC to get this bonus. To withdraw your bonus, you need to bet the bonus amount about ten times on sports bet that have at least 1.5 odds or more. The sportsbook features a VIP and Comp Point (CP) program. You earn CP for every US$20 bet you make, and can exchange the points for real money. Meanwhile, there are two levels in the sportsbook VIP program. The Gold Level, which you can reach by getting 1,000 CP, will give you free entry to most of the site’s tournament events. The VIP Level, achievable by getting 10,000 CP, will give you a cashback bonus of 10% each month and a 100% bonus promo code you can use once per week. Overall, the small number of promotions is a big setback for this sportsbook. In addition, the amount you get from the welcome bonus is incredibly smaller than what other sports betting sites have to offer. One of Riobet’s strong points is the many betting markets available. The site provides odds for more than 25 different sports, racing, and other special competitions. From ATP Challenge Tours to Dreamhack League of Legends matches, there is something here for everyone. There are also many in-play events for various competitions. Matches for popular tournaments or events are rich in betting markets. These games are where you can find bets like clean sheets or match flow wagers for World Cup games. You are sure to get more than the usual money line or point spread bets from this sportsbook. On top of the extensive market, you can change the odds to decimal, American, or fractional. The only negative part of the sports betting site is the lack of option to change the layout design of the sportsbook section. You have many ways to fund your account and to cash out your bankroll. In fact, Riobet accepts both Bitcoin and fiat payments. The option to use both crypto and fiat when paying puts this sportsbook above other competitors. The US$10 minimum deposit, on the other hand, is a slight negative since other gaming sites allow players to deposit less than ten dollars into their player accounts. The options for cashing out your money are the same as the deposit methods. But it is important to note that to withdraw, you can choose only the same option that you used when funding your account. If you top up your balance with Bitcoin, for example, you can cash out your money using only Bitcoin wallet. Another thing to note is that the smallest amount you can take out of the sportsbook is US$10. Explore other sportsbooks and you will see that the payment choices and low minimums presented by Riobet are good enough. 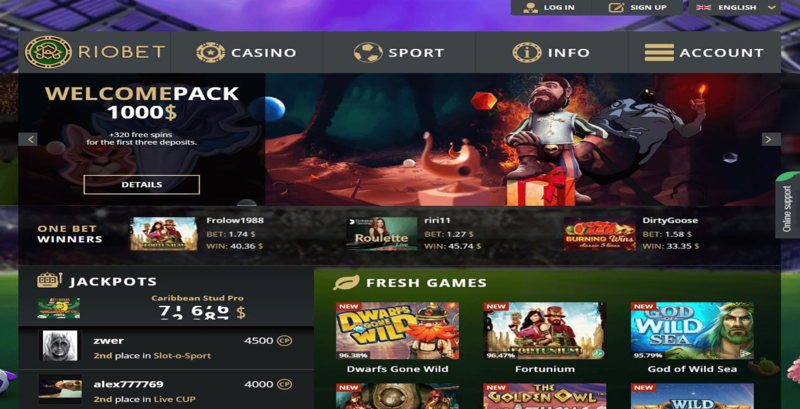 Other gaming sites impose high deposit thresholds and even provide only two or three banking options. Riobet: Is It Worth It? Riobet has most of the things you want from a Bitcoin sportsbook. The large betting market and Bitcoin payment option makes this site better than others. The US$10 minimum deposit, along with different fiat and crypto payment options, makes this site open to any type of punter. The only thing that brings this site down is the limited promotions and lackluster VIP program. You can find other sportsbooks that deliver a flow of sportsbook promos like welcome bonuses and cashbacks. But Riobet more than makes up for these setbacks with its extensive sportsbook markets, making the sportsbook still worthy of your membership.